Really sorry, but we wrap these beautiful plaques very, very thoroughly and pay couriers lots and lots of money for a special delivery service, so we ask you for a contribution of £8.50 towards the cost. You know I bang on all the time about waste, about all the energy we consume to make stuff that we just throw away. Well here we're showing something that does take some energy. 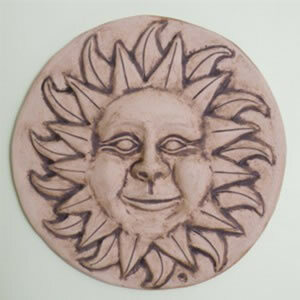 But the energy produces beautiful ceramics, wonderfully and carefully hand crafted by Karen Edwards. You certainly won't be throwing Karen's work away ! I'm really so, so chuffed at being able to offer Karen's garden plaques. Not only are they absolutely gorgeous but each takes at least 2-3 weeks of careful skilled application - and each will be totally unique. Karen will mould your plaque, then carefully carve away excess clay whilst it is allowed to dry naturally. After the clay is dry, your plaque is given its first firing. This turns the fragile clay into a ceramic which is strong enough for Karen's next process. She will apply a metal oxide solution*, then scrub it off to really bring out the surface texture. Liquid clay and glaze is applied, then comes the second firing. This is at 1280 degrees centigrade, so the clay is totally vitrified making the plaques safe to be left out in all weathers. Cheering you up on the dullest, greyest of days ! 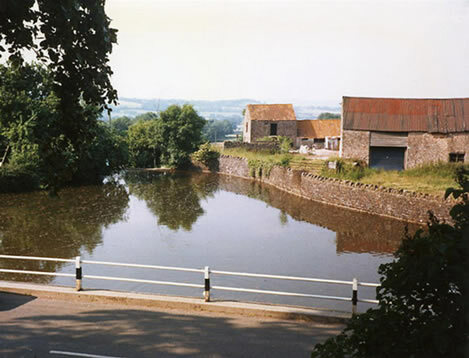 Karen lives and works in Somerset, and produces plaques and sculptures which are heavily influenced both by her love of gardening, and the surrounding landscape. 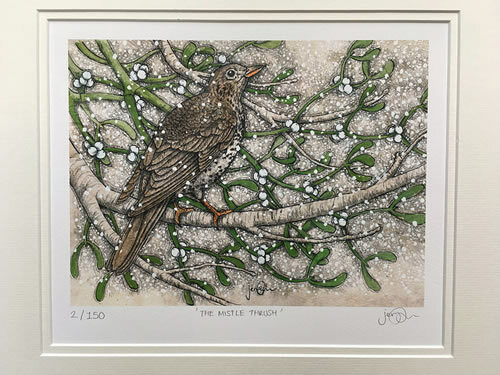 You may have to wait a little while for one of Karen's plaques - but it will bring something so inimitable, so unrepeatable, to your garden for generations to come that a short wait is really worth putting up with ! Never has the phrase 'small but perfectly formed' been more apt than when applied to these carefully, and so slowly and skilfully crafted, ceramics. They are, simply, a delight ! It's 20cm wide and 16cm high and about 2.5cm thick. We all look at things in our own way, but to me it's so evocative of space, the countryside, joy, freedom all tinged with sadness. 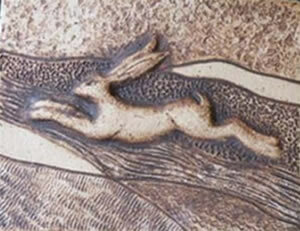 Have you seen a hare lately ? 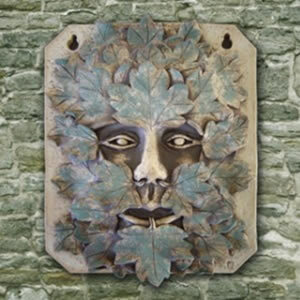 Karen can craft two sizes of the Green Man plaque, although the larger is to special order. The smaller is about 19cm wide, and about 22cm high, the larger, the lower photo, is 28cm wide and about 38cm high, weighing in at about 3 kg. Nobody really knows the history of the Green Man. The first sculptures we can see come from pagan Roman times, but then there are loads of 'Green Men' in mediaeval churches and cathedrals. 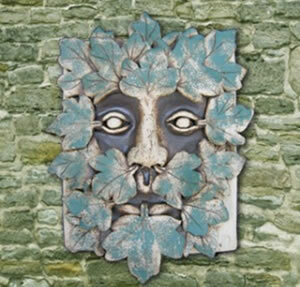 Somehow though I think the Green Man goes way, way back, his inscrutable gaze being with us before history began ! Old Helios has a 32cm diameter, while little Apollo is about 15cm. Don't you just love that broad minded cheeky smile, they know the stories of countless gardens ! The old chap, a 'Titan', had the job of carrying the Sun across the sky in his chariot, dousing it in the sea every night. Apollo, was an upstart 'Olympian' who, led by Zeus, helped overthrow the old Gods. Incidentally if you are as interested as we are in hand crafted items which would almost certainly be totally unique to you, take a look at http://www.thenaturalgardener.co.uk/islay_tweed_jackets_and_smocks.php completely handmade, even the tweed is specially woven, and totally sustainable !